The number of new listings coming on the market has seen a decline in Calgary, thereby having a negative effect on resale sales growth. According to CREB, resale sales growth fell by more than two percent in March 2013 when compared to the previous year. The reduction in supply has lead to a six percent reduction in sales growth when comparing March 2013 to March 2012. Year-over-year prices have also increased by nearly nine percent to $466,500. Although market conditions are still far from where they were in 2006 and 2007, market conditions have tightened. Due to poor market conditions, buyers became accustomed to being able to take their time to make decisions regarding home purchases. In the current market conditions, buyers do not have the luxury to delay their decisions too long. Housing demand has continued to grow due to continued employment growth and tighter rental conditions. Furthermore, single-family homes available at affordable prices are starting to become more difficult to find. In fact, single-family listings below $500,000 have been falling at double-digit rates. As a result, consumers are increasingly looking into condominiums, the new home market and homes in surrounding towns. 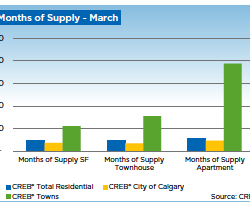 CREB reports that the condominium townhouse market achieved record year-over-year sales in March 2013. Condominium apartment sales, on the other hand, fell by nearly three percent when comparing March 2013 to March 2012. On the other hand, when compared to the first quarter, sales activity increased by six percent to 830 units. Condominium townhouses increased by 15 percent to 652 when compared to the first quarter. The condominium apartment market continues to remain in balance. Not only does the condominium apartment market remain in better supply than the single-family market, but the units have also remained within an affordable price range. The benchmark condominium apartment price was $257,700 in March, representing a six percent year-over-year increase. Meanwhile, the condominium townhouse benchmark price increased by four percent to $268,800.